General English English courses in your town or community. Lively, relevant lessons from an enthusiastic, experienced teacher. Business English Lessons at your office or workplace, making intelligent use of high-quality materials. Small groups and one-to-one. From CEFR A2 (Pre-intermediate) to CEFR C1 (Advanced). 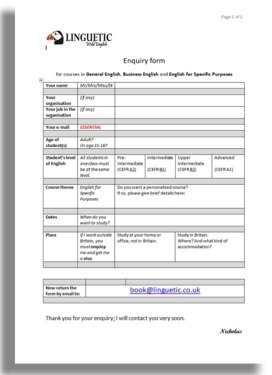 English for Specific Purposes Academic English, or a special course (professional or cultural) created for your company, charity, association or community. Wild English English course with an environmental theme, in summer in Scotland.